You may want to grab your tissues for this one! Disney Parks Blog shared that Minnie Mouse met one of her biggest fans, who happens to be an 8 year old girl named Lexi. Lexi recently underwent a successful kidney transplant surgery after dealing with health issues for most of her life. In Lexi’s case, her kidney was donated to her by her dad. She was born without a bladder, which is a condition that few babies have been able to survive. She is known for being an extremely resilient and exuberant young lady. 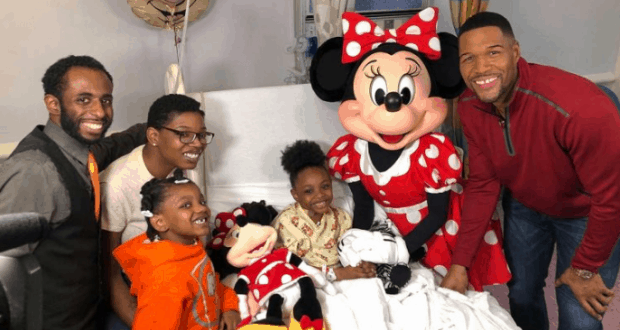 She was visited by Good Morning America’s Michael Strahan at Mount Sinai Hospital with… Minnie Mouse, who happens to be her favorite Disney character. Not only that, Michael Strahan and Minnie Mouse announced that Lexi and her entire family was invited for an amazing trip to Walt Disney World! Last year, The Walt Disney Company Chairman and CEO Robert A. Iger announced a new $100 million commitment to improve the family and patient experience at children’s hospitals around the world. This patient-focused initiative expands our rich legacy of supporting children’s hospitals, dating back to Walt Disney himself, and makes experiences like Lexi’s extra special. This family is amazing and we are so excited for them to get this amazing trip together!